Louis Conard, Publisher was a French publishing company founded by Louis Conard (1867-1944) in 1902. 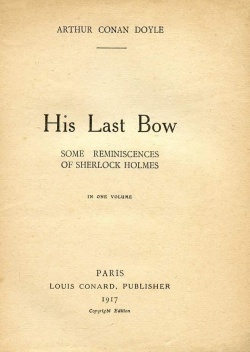 Louis Conard published 2 volumes of short stories written by Arthur Conan Doyle. The company is wrongly spelled "Louis Conrad" in many bibliographies (i.e. Green & Gibson, De Wall). This page was last edited on 5 January 2017, at 19:29.